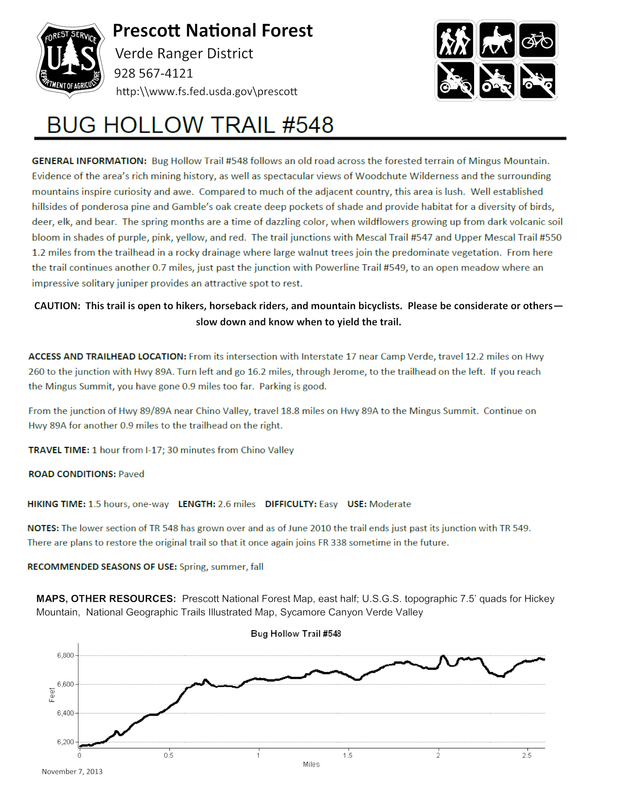 Conveniently located near the Mingus Summit on Highway 89A, The Bug Hollow Trail #548 is an old, closed road turned Forest Service trail that meanders along Mingus Mountain's forested slopes, eventually depositing one into Mescal Gulch. It can also be hiked in conjunction with its connecting trails: Mescal Trail #547, Upper Mescal Trail #550, Powerline Trail #549, and North Mingus Trail #105. Hiking the Bug Hollow Trail from top to bottom is easier than from bottom to top, due to the lower end being unsigned and not as easy to follow. From its upper trailhead along Highway 89A, the Bug Hollow Trail passes through a gate next to a trail #548 signpost, and heads north and downhill along a closed road into ponderosa pine forest. The trail levels off as it circles around a 6900 foot hill and soon crosses two lush drainages, the second one harboring a couple of small aspens, a rarity in these mountains. Tall pines and gambel oaks tower above as the trail enters a third drainage, that of Mescal Gulch. The trail passes signed junctions with the Mescal Trail #547 at 1.25 miles, which heads down the creek bed of Mescal Gulch, and then, a few hundred feet later, passes the Upper Mescal Trail #550, which heads up the canyon. Leaving Mescal Gulch, the Bug Hollow Trail contours north along drier slopes, where one can see Woodchute Mountain rising in the distance. At around mile 2 a signed junction with the Powerline Trail #549 is passed shortly before the Bug Hollow Trail arrives at a grassy meadow in a saddle, dominated by a large, lone juniper tree. Upon entering the grassy meadow, the Bug Hollow Trail becomes a bit more primitive, and one needs to keep an eye out for cairns and flagging tape from this point on. The trail is really not difficult to follow it's just an abrupt change from the old road you have been hiking on up until this point. The trail descends the brushy eastern slope of hill 6772, where one can look down Mescal Gulch at the Verde Valley in the distance. Clearing the 6772 foot hill, the trail descends its northeast ridge on loose limestone cobble and quickly arrives at an unexpected open, rocky, flat, camping area. Follow the cairns and flagging tape across the little flat to where the trail joins the route of a four wheel drive road. This road descends the hillside, curving west, and arrives at a road fork in a shallow ravine. Take the right fork, which heads downhill, and you will reach Forest Road 338 at the bottom of Mescal Gulch in 0.25 miles. The Bug Hollow Trail ends here, and is not marked as of this writing. Heading east on Forest Road 338 will bring you to the North Mingus Trail #105, while heading west will bring you to the signed junction with the Mescal Trail #547 in 0.2 miles. Highway 89A is just a few hundred feet beyond that. The Mescal Trail makes a nice return hike option, shaving off a bit of distance and taking you through a shady canyon environment. From the junction of U.S. Highway 89 and U.S. Highway 89A just north of Prescott, drive east on U.S. Highway 89A toward Jerome approximately 18.8 miles to the Mingus Summit (the turnoff to Mingus Mountain and Woodchute Mountain). Continue on Highway 89A for another 0.9 miles to the trailhead on the right, located at mile 337.5. The trailhead is a small dirt parking lot/turnaround area next to the highway. Bug Hollow Trail #548 leaves the north side of the trailhead next to a #548 trail signpost, and follows a closed road downhill (see hike description). From the Highway 89/Highway 89A junction just north of Prescott, head east on Highway 89A, towards Jerome, for 21.9 miles. At the bottom of Mescal Gulch (milepost 339.6), there is a pulloff and parking area on the left, near the Prescott National Forest sign. Forest Road 338, which is marked by a brown fiberglass signpost, starts on the right side of the highway here. Follow Forest Road 338 for 0.25 miles to the first road on the right (unsigned as of this writing). This is the beginning of Bug Hollow Trail #548.